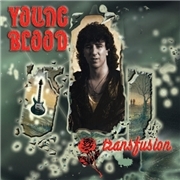 YOUNG BLOOD was formed back in the early eighties. Included among the countless bands of the NWOBHM they may not ring a bell (of more than a UFO single), but they were a good example of victims of circumstances. Their melodic take on the NWOBHM got them on tour with PHIL LYNOTT`S GRAND SLAM, TOKYO BLADE, STRAY and MOTÖRHEAD. A record contract was offered, more than one actually, but the constant instability of the group caused delay, and during that period things changed in the record company offices. Ultimately guitarist/vocalist Stewart Goodchild´s aspirations were cut short by grunge in the early nineties, but YOUNG BLOOD had folded in 1986. Here are the rare “First Blood” EP, plus a full unreleased album. great gigs at richmond live and town hall richmond.paul brown.young blood rock.